Detached chalet, situated on the edge of the village of Hommert. 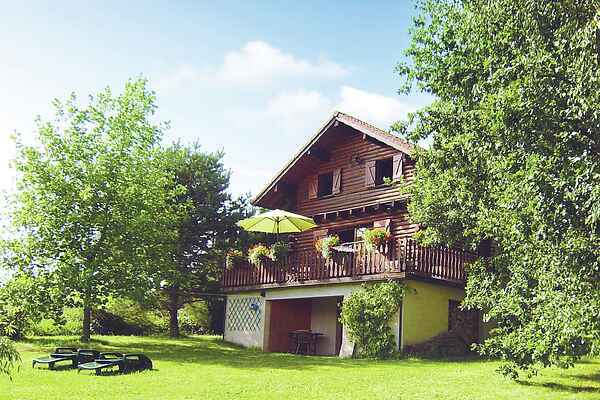 The chalet is surrounded by a wonderful grassy lawn (swing set, barbecue) directly sloping off into the wild nature. From the terrace you will have a beautiful view. Naturally, this is a great place for walks. Directly from the house, several walking trails begin through the deep pine forests of this wonderful area. For instance, you can walk to the clear Zorn river, about 1.5 km away, via a sloping path. In the valley of the Zorn you can visit the ruins of the medieval castle of Lutzelbourg (10 km). Be sure not to miss the Plan Incliné of St. Louis-Arzviller (5 km), the shiplift dating from 1969. For a restaurant, visit Sitifort (3 km), among others. Groceries are 3 km away. In this area you can take fantastic drives along the most beautiful routes through forests, along rivers and via vantage points. Like that of Rocher du Dabo (10 km) where you'll be sure to enjoy the beautiful panorama and view of Dabo. Also visit Sarrebourg (12 km) and Saverne (19 km).